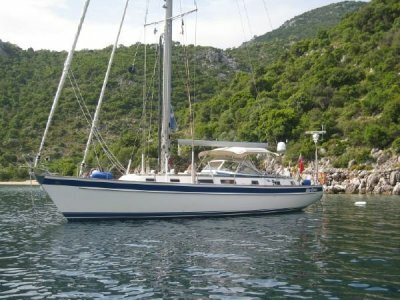 Immaculate 1991 Tayana 55 now for sale. For its size, the Tayana 55 is perhaps the most successful yacht in the world, with over 80 boats built to date. 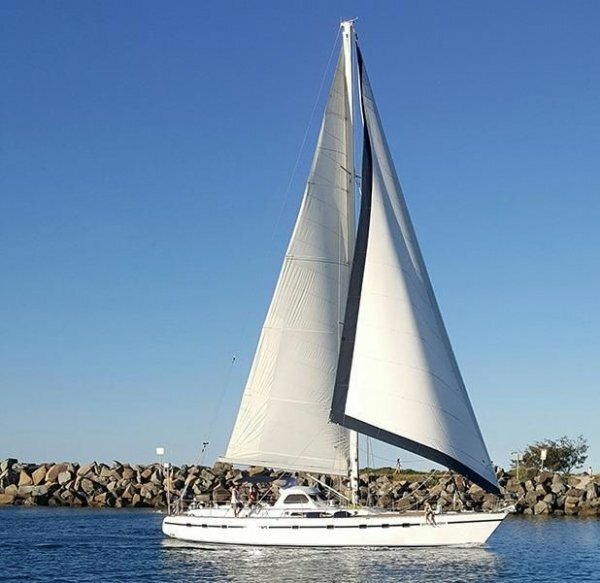 The Tayana 55 features distinctly in racing - the 2014 Round the World Cruising Rally was won by a Tayana 55, also The 1995 Caribbean rally. 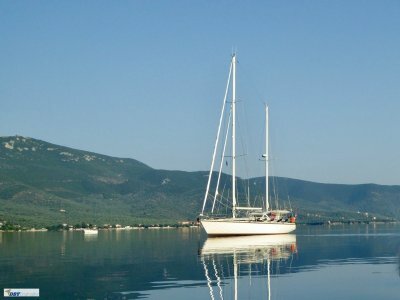 The Tayana 55 provides the space and sailing performance of most yachts over 65 feet. The spacious galley and storage capacity equates to long term cruising in style. The Tayana 55 even features a walk in engine room! Stunning teak deck spaces seem endless and functional, and the low silhouette gives the Tayana 55 it's distinctive look. The deck is a composite construction using encapsulated marine grade ply. All deck hardware is through bolted using stainless steel backing plates. A sound construction with - solid fibreglass hull, hand laminated according to Lloyds specifications. A matrix of longitudinal and transverse foam-cored stringers in the lower hull providing maximum hull stiffness. Internal cast iron ballast glassed into a modified fin keel with 7'2"draft. Skeg mounted rudder, with internal stainless steel rudder post and integral stainless steel reinforcement. Step down below and you immediately notice the functional galley. Headroom galore right throughout the vessel. Two forward cabins with head and tall shower area (6'6"). 1 enormous aft cabin with ensuite head and shower. Stainless steel port openings. Warm timbers have been used extensively in the interior fitout. Air conditioning to salon and cabins, digital TV, inverter with high amp charger, large purposeful Navigation area with high quality instruments including Icom VHF radio, JRC 1000 digital radar, Thrane Satcom, Autopilot linear drive with Navigation station redundancy, Garmin GPS plotter. 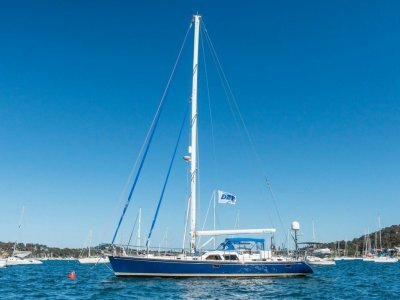 Performance, safety, comfort - this Tayana 55 is ready to sail anywhere around the globe. 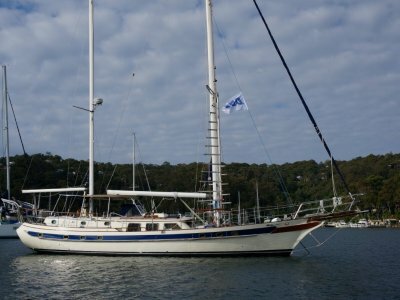 Builder : Ta Yang Yacht Building Co. Propeller : Tristream 4 blade folding. Toilet Type : Marine with holding tank. Galley Notes : Outstanding functioning galley as good as home, roomy and airy. Stove : 4 burner gas + Oven + microwave. Electronics Navigation : Autopilot, wind speed and direction. Garmin Plotter, Depthsounder, Log-speedometer, Compass, JRC1000 Mk II radar. Entertainment and Appliances Notes : TV, DVD and CD players with cockpit speakers. Dinghy : Achilles Inflatable with 3hp Yamaha outboard. Deck Construction Material : Teak decks and cockpit. Anchor / Winch : Electric windlass. Lewmar 3 x 40ST, 2 x 43ST, 1 x 46ST, 2 x 52ST, 2 x 66ST. Covers : Bimini top. New clearview cover, new hatch covers (2015), full vessel covers. Mast/Rigging : Twin spreader, Kenyon mast, Furlboom boom. S/steel x 19 rigging, s/steel chain plates. Sail Inventory : Hood main. Yankee cut 130% genoa. North Sails jib. Asymmetrical spinnaker, Harken furler. Engine Room : Walk in style with genset, insulated from heat and sound, work area. Deck Gear : Lewmar S/T winches, fenders, dock lines, boat hook. Ground Tackle : 30kg Bruce, Danforth H3100, Maxwell 3500.60m x 10mm chain. Safety Gear : Flares, EPIRB. Anti-foul : Scheduled February 2017. Remarks : Bronze seacocks, Cockpit cushions and sunbathing deck cushions.